I haven't been writing much of late due to a variety of things, so I went looking through my files for something old that would work for today. I found this poem I wrote in January 2009. © Diane Mayr, all rights reserved. 1911 postcard courtesy SMU Central University Libraries. I rarely use a centered format for my poems, and I didn't for "Finis," but it looks much better if centered within the circle in this illustration. Have a good New Year's Eve, and healthy and happy 2018. To those of you experiencing this spell of Arctic weather, please stay warm and bring your animals indoors! 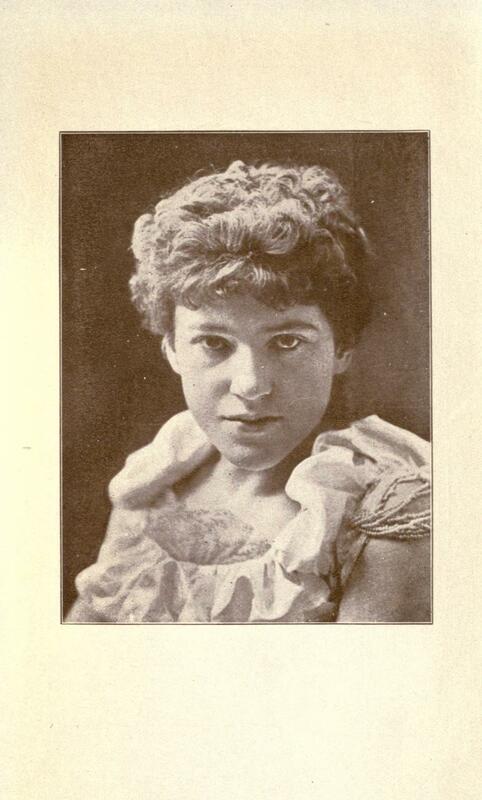 Photo of Ella Wheeler Wilcox from Poems of Reflection, 1905. This year can't be finished fast enough for me. I pray that 2018 will be better than 2017 has been, but I have my doubts. The above poem matches my mood. I used to say I was an eternal optimist, but much of that has been beaten out of me by the events of the past year. Ella Wheeler Wilcox, too, seems to have been of two minds. She also wrote a poem titled, "Optimism." And slow to note the cloud that threatens storm. Stays longer with me than the night hawk's cry. And men grow better as the world grows old. Both poems are from Poetical Works of Ella Wheeler Wilcox, 1917. 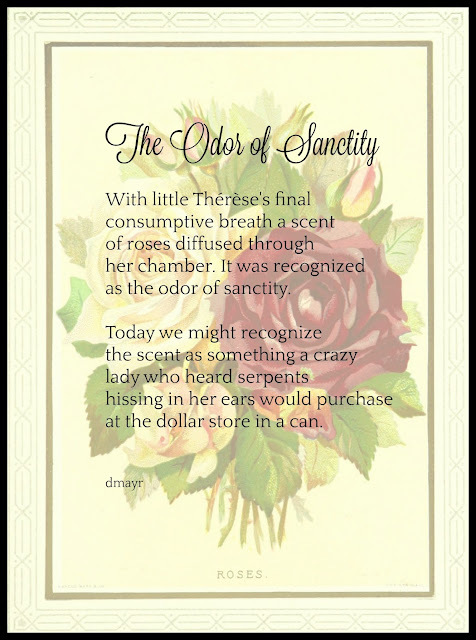 Please stop by My Juicy Little Universe where Heidi is rounding up today's poetic offerings. Here's to a 2018 where we will see "More good than evil in humanity." 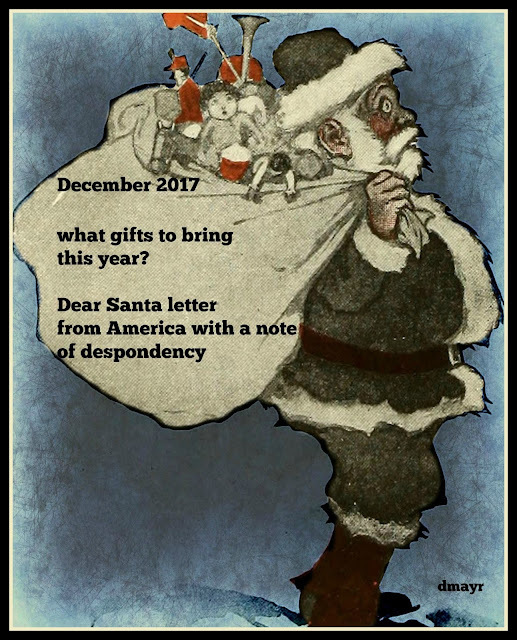 Poetry Friday--"Time for Santa Claus"
It's time to leave politics aside for a few days and I'm not going to attempt an original poem, it's a day for light-hearted holiday fun. 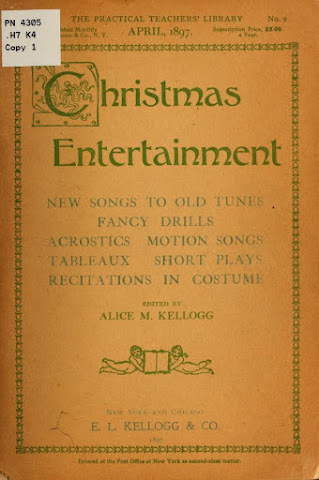 Here's a "sung-to-the-tune of" song from a collection titled Christmas Entertainment: New Songs to Old Tunes, Fancy Drills, Acrostics, Motion Songs, Tableaux, Short Plays, Recitations in Costume. edited by Alice M. Kellogg (1897). Christmas comes with loud huzzas. Hark! the bells! Oh, hear them ring! Yes, hurrah for Santa Claus! Blow the trumpets, shout huzzas! On the off-chance you're not familiar with the tune "Ta-ra-ra Boom-de-ay," here's a recording of it sung from the sheet music, which allows you to read along. The song is reported to have originated in the 1880s in a St. Louis brothel where it was sung by a woman named Mama Lou. It was first publicly performed in Boston for a 1891 musical review called Tuxedo. "Ta-ra-ra Boom-de-ay" became a music hall favorite in England. Considering the tune was adapted for use by American school children by 1897, it must have been fairly popular in the U. S. and had lost its off-color connotation. The tune was resurrected in the late 1940s for the theme song of the children's program, Howdy Doody! Stop by Buffy's Blog for the Round-Up. 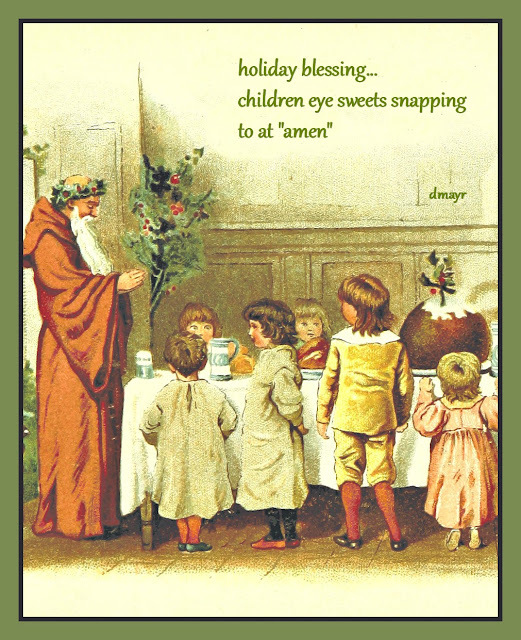 Then, let us all be merry! 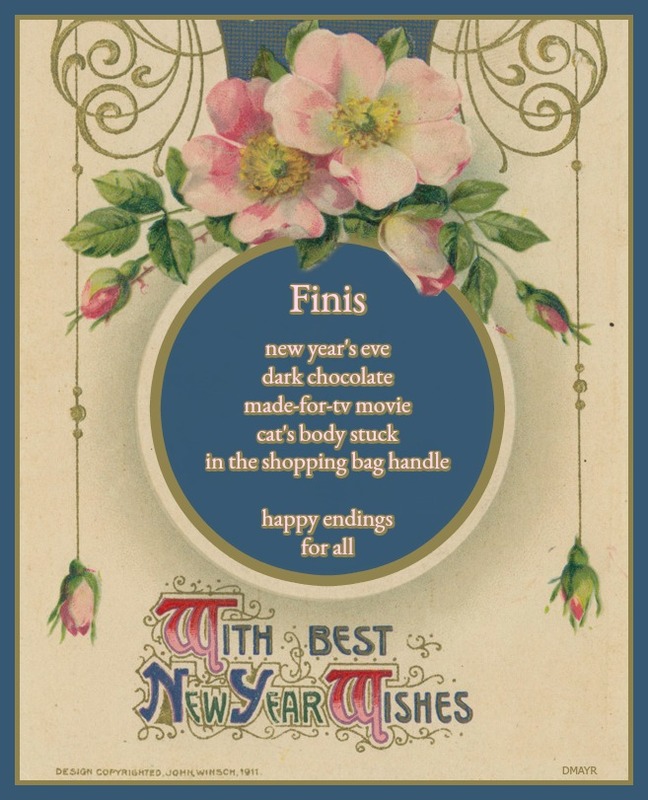 See you next week for the last Poetry Friday of 2017. How can that be? I found the illustration and the look on Santa's face wrote a cherita for me! © Diane Mayr, all rights reserved. Illustration from St. Nicholas magazine, 1909. 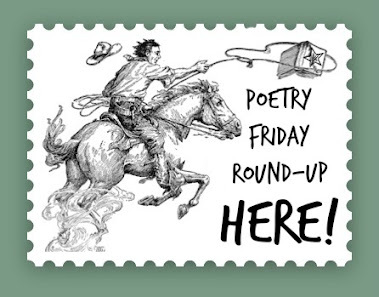 Poetry Friday--The Round-Up is Here! Yes, indeed, the Round-Up is here! Welcome and be sure to leave your links below! I've been drowning in political discussion and sometimes my poems have a political point to make, but, for the Round-Up I promised to keep my poem non-political. One of the suggestions I received last week was to write a poem about women; another was to write about celebrations. as the odor of sanctity. at the dollar store in a can. It isn't exactly a celebration, is it? If you're looking for me the explain it, you're out of luck. It began as one thing and ended up as something else. As Umberto Eco said, "The author may not interpret. But he must tell why and how he wrote his book." I've told you the why and how of my poem, so the interpretation is up to you. 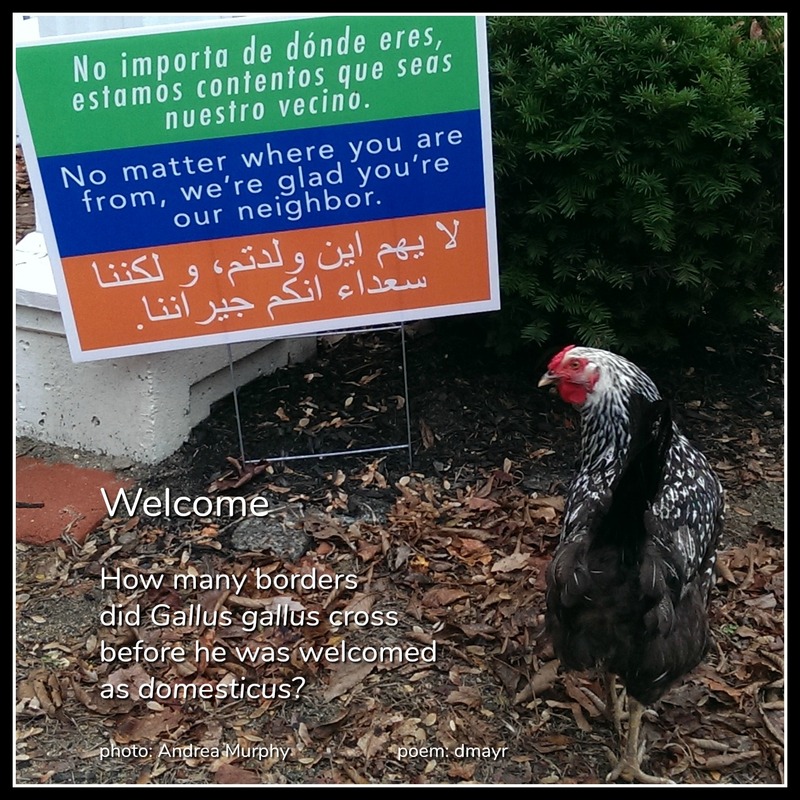 This is a senryu, that is, a haiku-like poem about human nature as opposed to Nature. I hope the women of Alabama realize the power they hold in their hands to effect the future of their daughters (not to mention the country in general). I don't dare predict the outcome. Hello poetry friends! The topic/prompt I want to suggest for the December 8 Poetry Friday Roundup is either/and: Respond to "When Life Gives You Lemons..." or write a poem using an object/making a drawing, as Amy Krouse Rosenthal did with a lemon drop. 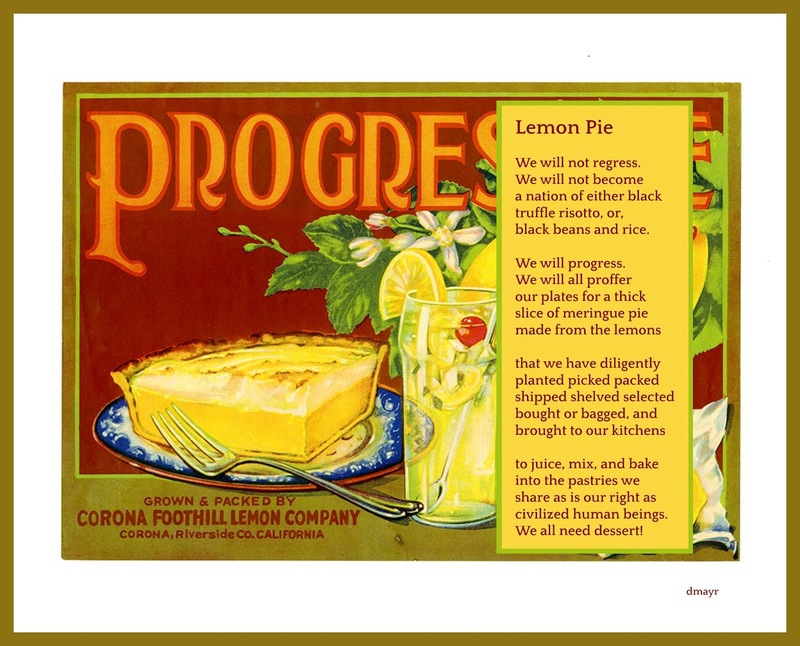 If your poem can be expressed visually through a picture or drawing--like Amy Krouse Rosenthal's "When Life Gives You Lemon Drops"--I would love to post everyone's visuals. Click on the image to enlarge for easier reading. © Diane Mayr, all rights reserved. I went looking for lemon images before starting to write, and when I found the label for Progressive brand lemons, a poem began to take shape! Next week I'm hosting the Round-Up and I promise not to post anything political. I admit, it will be difficult, but perhaps you can give me something to write about? I'm open to all suggestions! See you next Friday, if not before! Those of you who live in the United States: net neutrality is in danger! You have a week in which to make your voice heard. Please do so BEFORE December 14! Click here to get started. If you have no idea what net neutrality means, here's a video from Hank Green that explains it fairly well. The problem of maintaining net neutrality is still ongoing three years after Green's "debate" video, although the comment dates are no longer current. 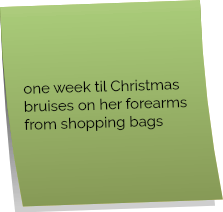 This haiku was written last December during Mary Lee Hahn's first #haikuforhealing challenge. 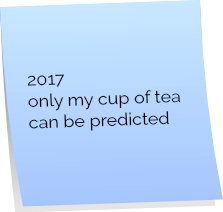 I'm trying to write a haiku a day during December for this year's challenge. I may or may not post any of them because I don't seem to feel much healing going on, and any of last year's hopes have mostly slipped away. If I do post any, it will be for an occasional Haiku Sticky or Happy Haiga Day! Poetry Friday--Chickens on the Loose! Children's writer, and my dear friend, Andrea Murphy, is the teaching director at Hogarth Country Day School (preschool). 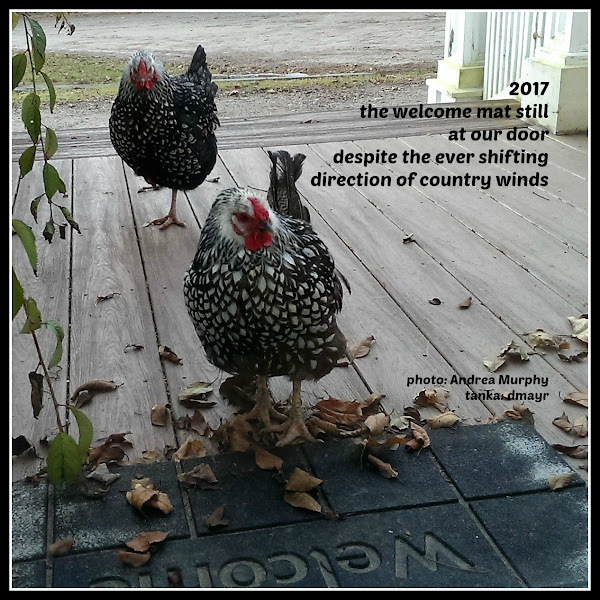 On the 6th of November she posted a photo of her little students gazing out the front door of the school, enthralled by two beautiful Wyandotte chickens. She assumed their owner would notice they were missing and attempt to locate them. Two weeks later they were still hanging out at the school eating the last of bugs and seeds in the garden. No one had come forward to claim them, and so, with the help of students' parents, the two fowl were finally captured and taken off to a new home before winter snows arrived. 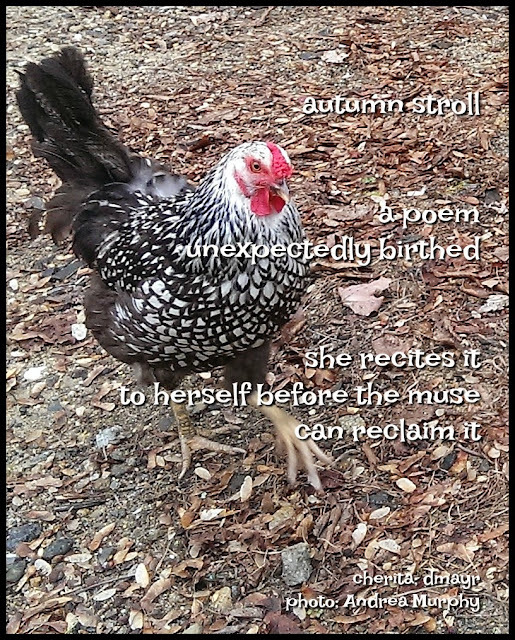 I asked Andrea to share her photos with me and I've written a tanka and a little ditty to go with them. Photo © Andrea Murphy, used with permission. 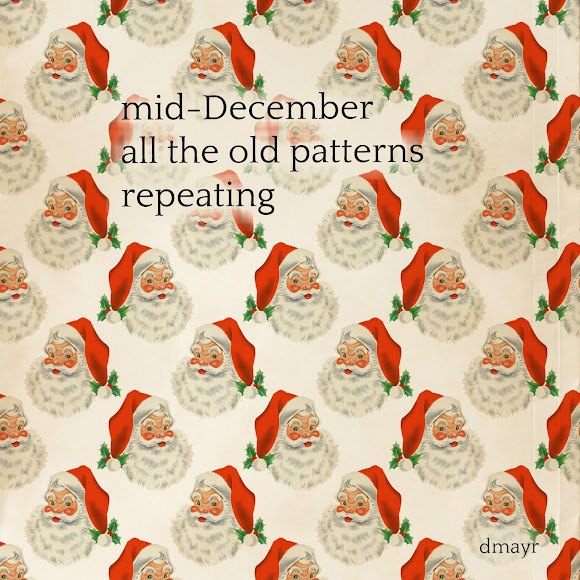 Tanka © Diane Mayr, all rights reserved. Photo, © Andrea Murphy, used with permission. 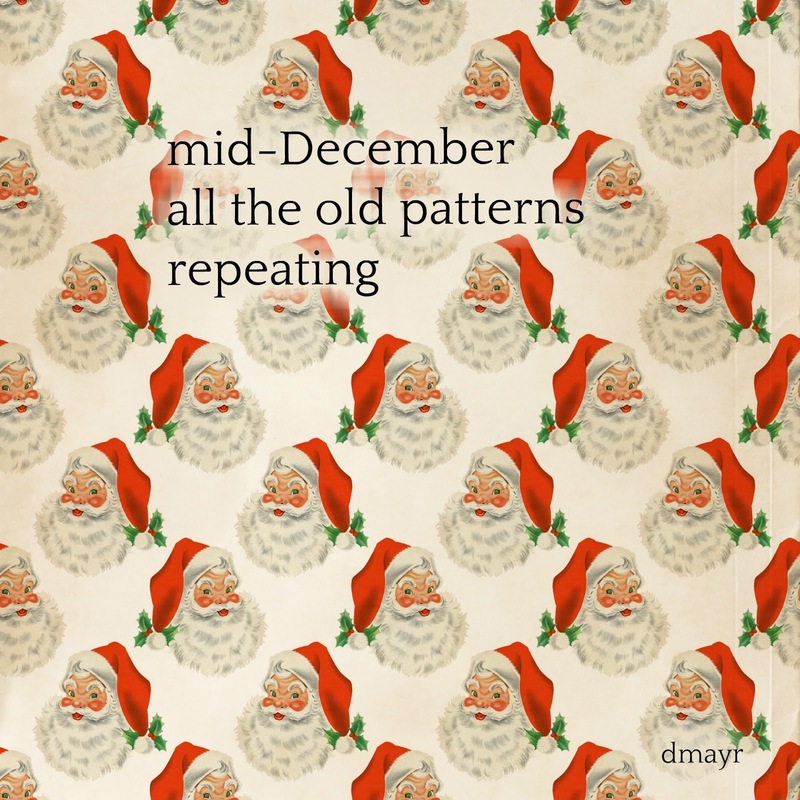 Poem, © Diane Mayr, all rights reserved. Gallus gallus is accepted as the progenitor of today's domesticated chickens, Gallus gallus domesticus. Mary Lee will be hosting the Round-Up this week at A Year of Reading. Be sure to stop by and have a day filled with poetry.